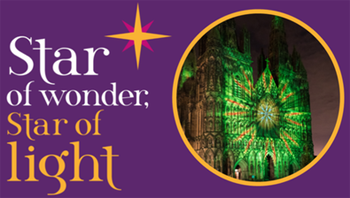 In keeping with this Christmas's Cathedral Illuminated project - Star of Wonder, Star of Light - this year's #AdventQuiz revolves around the word 'star'. Quite simply, the bar of an anthem, motet or carol which contains a star-related word (in any language) will be printed here. Only the starry word will be given, but all the musical notation surrounding it will be reproduced in full. For each day of Advent 2017 (which runs from Sunday 3 December to Sunday 24 December) a bar will be published here at midnight and accessed via the relevant link below, or via tweets and posts on our Facebook page sent out as reminders during the course of the day. To enter, people simply have to identify the title of the music and the composer and/or arranger. All the music is published and all features in the Cathedral Choir's repertoire. Entries will be accepted during the 24 hours after the publication of each day's bar at midnight. The previous days' bar will remain accessible through the links below, but entries will not be accepted more than 24 hours after the image is published. Within each 24 hour period, people can enter as many times as they like, but only their final answer will be accepted. There will be daily winners selected at random from the correct answers, and an overall winner with the highest number of correct answers; if there is a tie, the overall winner will be selected at random. Both daily winners and the overall winner will be named on Christmas Day and they, along with the answers, will be found at here.